A partnered donation turned into an exciting social media fundraiser held by Hanlon & Associates. With your help, the Hanlon & Associates team donated $300 worth of school supplies to the CHUM Annual Backpack Distribution. The significant pile of items was delivered to the Duluth Area Family YMCA Tuesday. 120 Assorted Colored Pocket Folders. 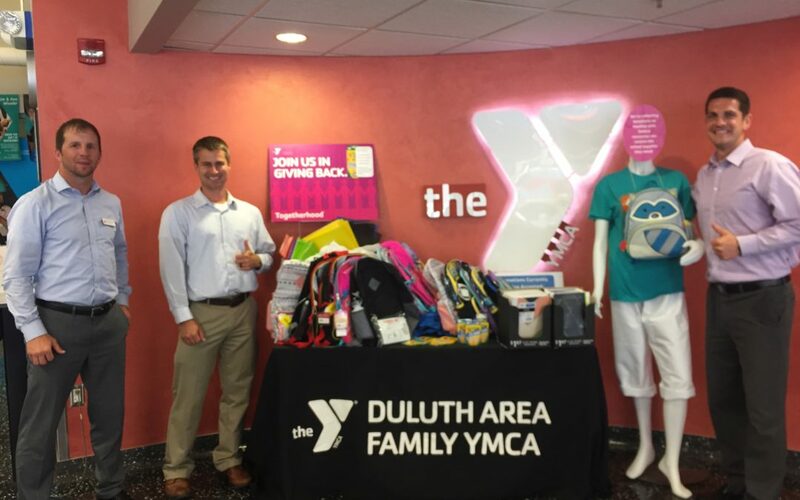 Insurance Agent and employee Eric Frost actively volunteers on the Programs and Operations Committee of the Duluth Area Family YMCA, who recognized the need for school supply help in the Northland. Frost personally contributed $100 to the CHUM school supply drive, asking boss Tucker Hanlon to match the donation on behalf of the company. The insurance brokerage took the pledge, but raised the bar by hosting a social media fundraiser to build momentum for the drive. The Facebook campaign raised another $100 to help local students. Since the company’s inception in January 2014, we have maintained high philanthropic values and demonstrate great investment in our community. Our staff is proud to be involved in a number of community and service organizations, including but not limited to: Duluth Area Family YMCA, One Roof Community Housing, ECO Rotary, Animal Allies, and the Women’s Health Center. In addition, the company has provided support for organizations such as CHUM, First Witness Child Advocacy Center, and LOON – Lyric Opera of the North. All it takes is a little effort to make a difference in a big way. Thank you to all those who participated in our Facebook drive. We are humbled by the response, and thrilled to see such high community involvement in the town we call home. Feel free to follow us on Facebook, too. We would love to hear from you!